...... You can Edit, Delete or Block your friends list using this service. Stay in touch with your friends, family members. 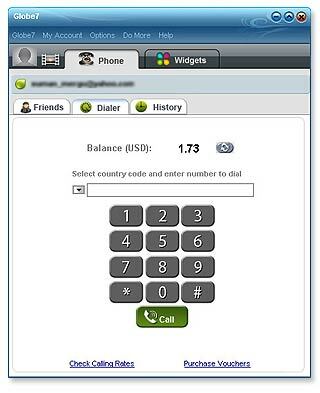 Send International / National SMS messages from Globe7 Mobile. Provides an easy-to-use interface to change your account password or you can recharge your voucher or even to know your call history. You can view all your missed calls, received calls and dialed calls from this feature and also analyze your call duration of the made or received calls. Qweas is providing links to Globe7 Mobile Symbian Edition 9.2 as a courtesy, and makes no representations regarding Globe7 Mobile Symbian Edition or any other applications or any information related thereto. Any questions, complaints or claims regarding this application Globe7 Mobile Symbian Edition 9.2 must be directed to the appropriate software vendor. You may click the publisher link of Globe7 Mobile Symbian Edition on the top of this page to get more details about the vendor.